Notes: You will see a bunch of bicycles and also piñatas - that's us! We are changing the start location to catch the end of the Euro-Style Picnic at Memorial Park. 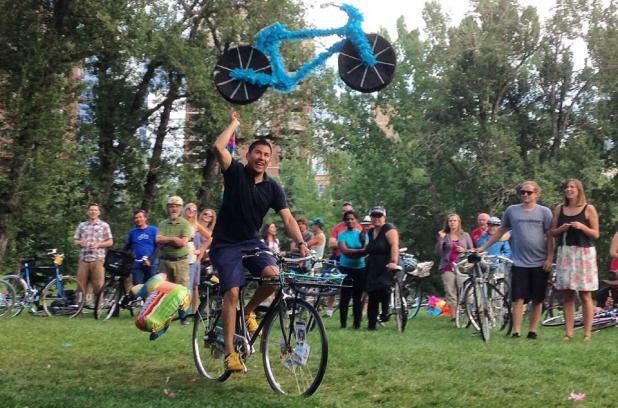 Join us for an easy, fun ride to celebrate Cyclepalooza 2015's closing: our Second Annual Piñata Ride! We will meet at Central Memorial Park at 5:00 PM. We will hang out there for a bit. We will leave around 5:45 PM and do an easy ride to arrive to our Piñata bashing location in Prince's Island. We will then hop on our bikes and take turns breaking the Piñatas. How does that work? just take a look at the pic from last year.